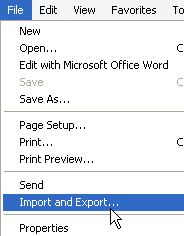 An Import/Export Assistant will be displayed. Follow the instructions and choose Export Favorites. Save your favorites and remember the file name and location. Now you are ready to import your favorites to SiteBar.